If you would like your garden bin(s) emptied in 2019, you will need to sign up to our garden waste scheme. It costs £36 per garden bin for fortnightly collections between January 2019 and December 2019. This is for a maximum of 23 collections (the garden bin service is suspended over Christmas and New Year). To subscribe to the garden waste service please fill in the online booking form or click the subscribe button. PLEASE NOTE: You will be taken to Lichfield District Council’s website to subscribe to the garden waste service. Your payment will be processed and your receipt will be issued by Lichfield District Council on behalf of the joint waste service. Please also ensure that you have your debit/credit card to hand as delays in entering your details may cause your session to expire. You may also be asked by your bank to verify your payment via their secure banking verification process. You will receive your bin sticker within 10 working days. Please do not place your 2019 sticker over the 2018 one. 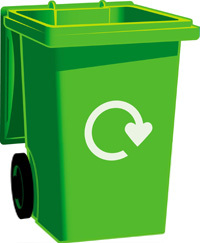 If you do not sign up to the scheme, your garden waste (green) bin will not be emptied. For more information please read the Garden Waste FAQs page. There is no deadline for subscribing to this service, you can sign up part way through the year if you wish. Leaves, weeds, tree and shrub prunings, grass and hedge cuttings, short branches and twigs, garden plants and vegetables. We cannot collect: food waste, plastic bags or biodegradable liners, cardboard, paper, plant pots, pet waste, soil or turf, or large pieces of wood or branches as these are not easily compostable. Please make sure your bin is at the kerbside from 6.30am on your collection day. Bins will not be emptied if they are heavy/overloaded. To report a missed or damaged bin, you can fill in one of the online forms below or telephone 0345 002 0022 by the end of the next working day after it was due to be emptied. If the crew have not reported an issue with your bin, we will return within three working days to empty it. Your garden waste goes to an outdoor composting facility (Greener Composting, Wall) and is used on local farms.